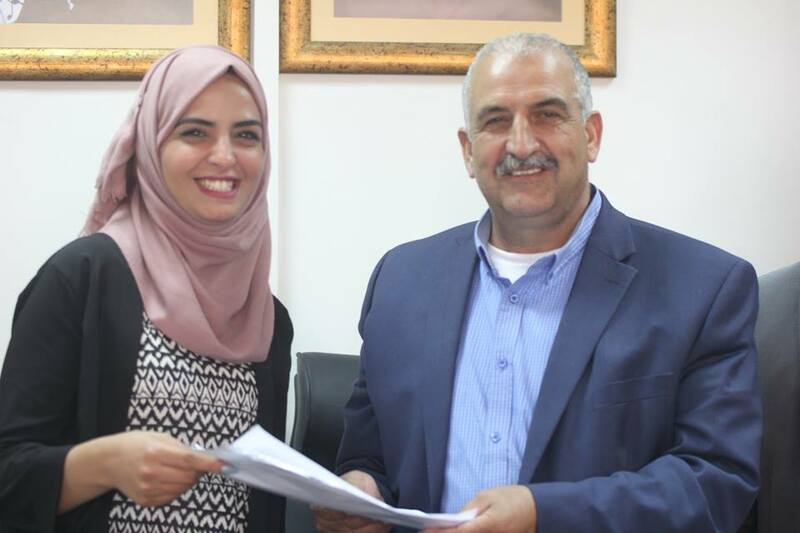 Governorate of Jerusalem an introductory meeting for the Jerusalemite young lady, Manar Issa. Burj Al-Luqluq Social Center Society, in partnership with Pal Vision Institution, organized at the Governorate of Jerusalem an introductory meeting for the Jerusalemite young lady, Manar Issa. This one experience was unique as it allowed Manar to know the different departments of the governorate on Sunday 24/04/2015. During the tour, Manar visited the Governor’s Deputy, Mr. Abdallah Siam, as he talked about the governorate. She also visited Mohammad Halaseh, Alaa Salah, Jumana QIrresh, Hamdi Rajabi and Mohammad Turi from the administrative office of the governorate. It is worth mentioning that this tour was executed within Yallah Shabab Project funded by the UNFPA under the supervision of the Higher Council for Youth and Sports, in the aim of creating joint activities in Jerusalem, the West Bank and the Gaza Strip.